SAALT applauds the United States Citizenship and Immigration Services (USCIS) and the Department of Homeland Security (DHS) for announcing this morning that DHS will extend work authorization, effective May 26, 2015, to some H-4 dependent spouses of H-1B visa holders who are seeking employment-based lawful permanent resident (LPR) status. An estimated 179,600 H-4 dependent spouses will be eligible to apply for employment authorization in the first year of implementation, and an estimated 55,000 H-4 spouses will be eligible to apply in subsequent years. Numerous South Asians enter the U.S. through the H-1B visa program, and figures from the State Department show that approximately 76% of those who received H-4 status in 2013 were from South Asian countries. Many H-4 dependent spouses have found themselves to be involuntary homemakers upon their arrival to the U.S., which not only impacts their family income and sustainability, but also diminishes their ability to expand upon professional skills. SAALT has called on USCIS to allow all employment authorization for all H-4 visa holders, as H-1B workers and their families are most successful when H-4 visa holders have the ability to contribute to their household income and our economy, and pursue their goals. Today’s announcement is a welcomed first-step that will dramatically help some families in the U.S., but the success of H-1B workers, their families, and our nation’s economic growth is limited when only some H-4 visa holders are eligible for work authorization. With the opening of the White House Summit on the Countering Violent Extremism (CVE) program this week, SAALT continues to stand in opposition to this program. CVE is centered around the problematic concept of requiring Muslim individuals, institutions, and community organizations to question, spy, and report members of their own community for alleged terrorist activity. It is also based on the dominant and flawed narrative of violence and terrorism being patently attached to Islam, which is inaccurate and divisive. 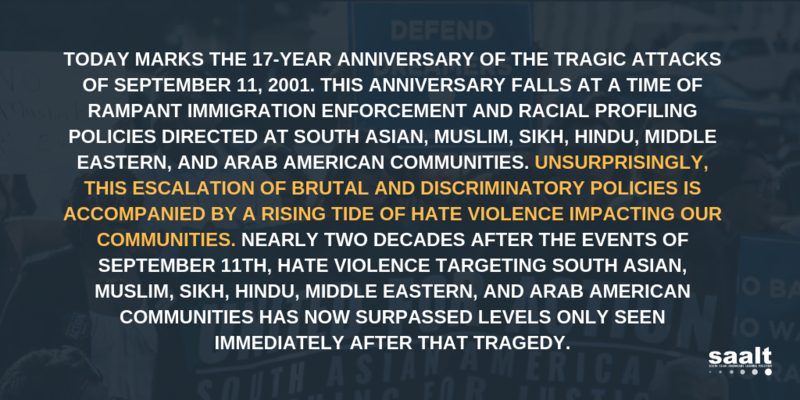 This narrative is especially troubling in the face of growing hate violence in this country targeted at Muslims, those perceived to be Muslim, and communities of color at large. SAALT documented many of these incidents, including those that are underreported or ignored in mainstream media, in our recent report Under Suspicion, Under Attack and many more have been in the news in just the last few months. The execution-style murder of three Muslim students in Chapel Hill, North Carolina, is the latest in these egregious attacks on Muslims in the United States. It is time to have a richer and deeper discussion on the breadth of violent extremism in this country, one that honors the slew of victims of domestic extremism. SAALT stands firmly against the misguided U.S. District Court Judge’s ruling to award a temporary injunction on the expanded DACA and DAPA programs. We continue to stand with immigrants who deserve the right to stop living in second-class status, attend college, work above the table for fair wages, and be reunited with their families. Even though there have been previous attempts to derail the President’s critical executive actions on immigration, including the Department of Homeland Security (DHS) funding bill with amendments that attempt to defund the programs, it is more important now than ever that the programs are implemented. While attempts to stop implementation of the President’s executive actions are largely symbolic and hold no merit—and we are confident the Department of Justice will successfully appeal the injunction in the 5th Circuit Court of Appeals—implementation of the expanded DACA and DAPA programs will now be delayed. Millions stand to benefit from expanded DACA and DAPA, including approximately 40 percent of the over 500,000 undocumented South Asians. President Obama is fully within his legal authority to implement his executive actions on immigration, and it is essential that these programs be permitted to proceed, especially due to Congress’ failure to act on immigration. To read more stories about how DACA has made a positive impact in the lives of South Asians, please click here.